RSMSSB Answer Key 2019: Supervisor (Women) Answer Key 2019 is available now for RSMSSB Supervisor (Women) Exam 2019. 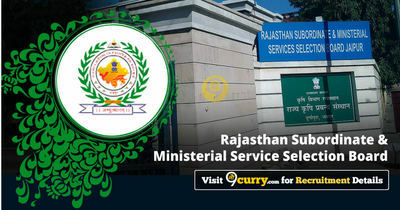 The exam was organized by Rajasthan Subordinate and Ministerial Service Selection Board on 03 Mar 2019. RSMSSB Agriculture Supervisor Answer Key 2019: Rajasthan Subordinate and Ministerial Service Selection Board has issued the Answer Key on 25 Mar 2019 for RSMSSB Agriculture Supervisor Exam 2019 which was conducted on 03 Mar 2019. Answer Key can be accessed from the link given below. RSMSSB NTT Answer Key 2019: Rajasthan Subordinate and Ministerial Service Selection Board has issued the Answer Key on 25 Mar 2019 for RSMSSB NTT Exam 2019 which was conducted on 24 Feb 2019. Answer Key can be accessed from the link given below. RSMSSB Lab Assistant Answer Key 2019: Rajasthan Subordinate and Ministerial Service Selection Board has issued the Answer Key on 06 Mar 2019 for the exam. Answer Key can be accessed from the link given below. RSMSSB Aganwadi Supervisor Answer Key 2019: Rajasthan Subordinate and Ministerial Service Selection Board has issued the Answer Key on 05 Feb 2019 for RSMSSB Aganwadi Supervisor Exam 2019. Answer Key can be accessed from the link given below. RSMSSB PTI, TA and LSA Exam 2018 Question Objection: Rajasthan Subordinate and Ministerial Service Selection Board has issued the Answer Key on 29 Nov 2018 for RSMSSB PTI, TA and LSA Exam 2018 . Answer Key can be accessed from the link given below. RSMSSB PTI Answer Key 2018: Rajasthan Subordinate and Ministerial Service Selection Board has issued the Answer Key on 27 Nov 2018 for RSMSSB PTI Exam 2018. Answer Key can be accessed from the link given below. RSMSSB Tax Assistant Answer Key 2018: Rajasthan Subordinate and Ministerial Service Selection Board has issued the Answer Key on 27 Nov 2018 for RSMSSB Tax Assistant Exam 2018. Answer Key can be accessed from the link given below. RSMSSB Livestock Assistant Answer Key 2018: Rajasthan Subordinate and Ministerial Service Selection Board has issued the Answer Key on 27 Nov 2018 for RSMSSB Livestock Assistant Exam 2018 which was conducted on 21 Oct 2018. Answer Key can be accessed from the link given below. RSMSSB LDC, Junior Assistant Answer Key 2018: Rajasthan Subordinate and Ministerial Service Selection Board has issued the Answer Key on 14 Nov 2018 for RSMSSB LDC, Junior Assistant Exam 2018. Answer Key can be accessed from the link given below. RSMSSB Industry Extension Officer Final Answer Key 2018: Rajasthan Subordinate and Ministerial Service Selection Board has issued the Answer Key on 28 Sep 2018 for Industry Extension Officer Exam 2018 which was conducted on 22 Jul 2018. Answer Key can be accessed from the link given below. RSMSSB Industry Extension Officer Answer Key 2018: Rajasthan Subordinate and Ministerial Service Selection Board has issued the Answer Key on 12 Aug 2018 for Industry Extension Officer Exam 2018 which was conducted on 22 Jul 2018. Answer Key can be accessed from the link given below. RSMSSB Industry Inspector Answer Key 2018: Rajasthan Subordinate and Ministerial Service Selection Board has issued the Answer Key on 09 Jul 2018 for RSMSSB Industry Inspector Exam 2018. Answer Key can be accessed from the link given below. RSMSSB Sanganak Answer Key 2018: Rajasthan Subordinate and Ministerial Service Selection Board has issued the Answer Key on 22 Jun 2018 for Sanganak Exam 2018. Answer Key can be accessed from the link given below. RSMSSB Informatics Assistant IA Exam Answer Key 2018: Rajasthan Subordinate and Ministerial Service Selection Board has issued the Answer Key on 08 Jun 2018 for Informatics Assistant IA Exam 2017. Answer Key can be accessed from the link given below.